Hello there, thank you for looking at Conrad Bloemers Saatchi art gallery. He is from Holland born in Amsterdam. Did most of his schooling there too. By trade he was a florist and learned almost everything about color and composition. He did some art/photo college in Santa Barbara / Los Angeles. Conrad's method of painting is characterized by an urgency of vision, which he has been developing over several years. Conrad's technique involves constant assessment, measurement and exploration of materials. His abstracts are world eliciting as multitude of emotional and intellectual responses that we as viewers must resolve. He does work with different materials like polystyrene, wood, paper and canvas. He had a view exhibitions with his paintings here in Holland one of them was opened by the mayor (See his you-tube movie). 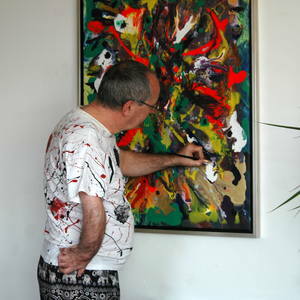 His artwork has been exhibited and acquired by numerous collectors across North America, Europe and Asia. Hopefully most of you will enjoy his art here online or at your home or office. Art district Amsterdam 2016, 2018. 't Wout gallery, Netherland 2015, 2017. Tiny's gallery, Netherland 2016, 2017. Gallery of work Lelystad, Netherland 2015. Warren Knap gallery, Seattle USA 2009. Art house Malibu, California USA 2008. Design store Cosentions, Malibu CA. 2004, 2006. Conrad's artwork was featured on tv in magazines and catalogs in the usa.